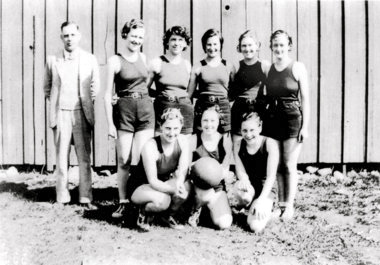 Dorena High School Girls Basketball Team in the early 1930’s Girls Basketball flourished in small rural schools from the early part of the 20th century until the mid 1930’s. The sport was deemed unladylike and too rough for girls in the late 30’s and virtually disappeared from High Schools until the 1970’s. Leta Mosby is holding the ball in the photograph. She grew up shooting a rubber ball through an oatmeal canister fastened to the kitchen door. Leta kept her love of Basketball throughout her long life. The only time she ever flew in an airplane was to see the Portland Trail Blazers play in the 1977 NBA Finals in Philadelphia. This information and photo are taken from an article in the Oregonian by Rachel Bachman.